Editor’s Note: The following article was penned by Olivia Angelescu, online media strategist and Leadpages Guest Blogger. Interested in writing for the Leadpages blog? Hit us with your best shot! Crafting an outstanding guest blogging pitch is more than just a hobby, it’s my go-to method for growing my email list (and my income). And I must confess, I have a recurrent dream. I read your blog and I think you do a great job. But, I think something is missing from it: ME. I am ready today to write a magnificent article for your blog. I don’t want any money, but I expect to include at least 3-5 links to my own website, because this is the whole purpose, right? Also, I want to ask you to publish this by the 3rd of May, as I need it for a big launch I am working on. So, when I should send you my article? I promise your audience will be amazed! And then I wake up from this dream and I realize it is, in fact, a nightmare, because I am all sweating, and I am (almost) in tears! 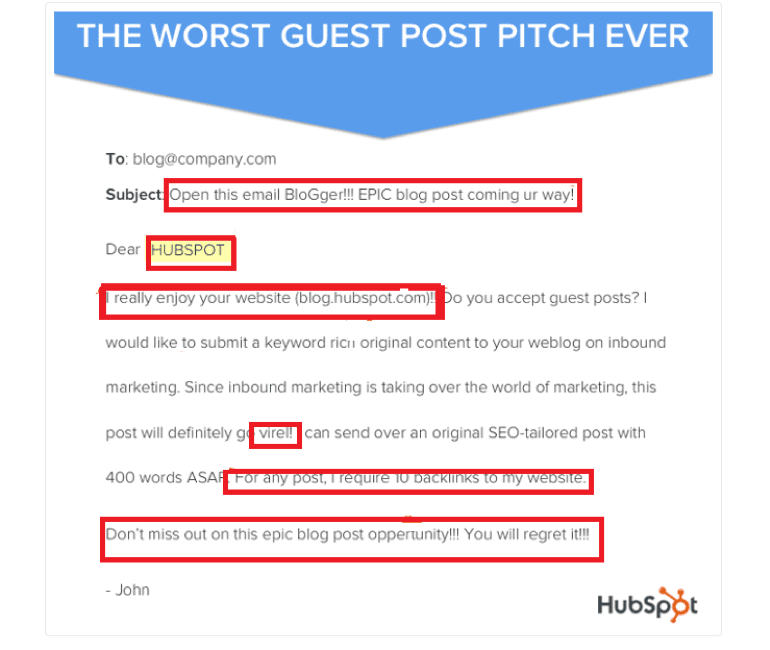 In case you now think that I have exaggerated with my example above, then check out this guest blogging email pitch example that one of the Hubspot editors received a while ago. So maybe there is a good reason guest blogging is looked down on: far too many people are doing it wrong. Just look at all the terrible mistakes that I underlined in this print screen. But I promise you this: by the time you finish reading this article, you will know how to put together a professional and persuasive guest blogging pitch that will make any editor want to work with you. If that sounds like what you’re looking for, let’s get started! First, let’s quickly see why you should guest blog in the first place. I know a lot of bloggers are doing it for SEO purposes. But guest blogging is much more than SEO. Building valuable connections with people in your niche that are more established that you (those you approach for guest blogging opportunities). This can go a long way. And if this is not enough for you, let’s see how today’s online marketing experts used it to grow their businesses. I know that when you are just starting out, you might feel insecure about your guest blogging abilities. I’ve heard this question a lot of times. When you are just starting out, you’re worried that you don’t have enough experience, that you won’t be seen as a credible author. Your website might not be ready yet. You have zero credentials in the online world. Nobody knows who you are. You are not a native English speaker and you are afraid of making fatal grammar mistakes. So, do you have a chance of getting featured on those cool blogs in your niche? Certainly! Everyone starts from zero. Except me, of course: I started from sub-zero! Yet, you are now reading my guest post, on Leadpages. I am not a native English speaker. I have put together my strategy, I took action and built my way up. This is how you will do it too. Stop overthinking and take action. Writing an article for your blog is one thing. Publishing it on a popular blog in your niche is a different thing. Also, every guest post is different, so you’ll need to adapt your approach a little bit every time. Therefore, I think most guest blogging pitch advice out there is wrong. I don’t think that “one size fits all” approach can be a winner in this case. If you read somewhere what an editor says about a good pitch, please note that this is just his point of view. Another editor might have a different opinion. You need to understand the big picture, the ground rules of guest blogging pitches and then have flexibility in preparing your game plan and personalize every pitch you send out. A lot of people are complaining about their lack of results with guest blogging pitches. They send a random email without doing any pre-work and then they say guest blogging does not work. I will show you the steps to take before sending your pitch so that you skyrocket your chances of receiving a positive answer. It all starts with a good list of websites to write for. I could write an entire book about how exactly you can do this, the smart way, but I trust that you know your audience very well and so you can easily guess where they hang out online. After you have this covered, the next step is to brainstorm the perfect article ideas for every website on that list. This will play a very important role in getting you featured. To do this, think about their audience’s needs and your topic. Where do the two of them intersect? What do you have to say that their audience would love to read? Write down at least five content ideas. Go through as many of these articles and see how you can make yours different. You can cover parts that were not covered before or just switch the angle (for example you can write your own story or a case study). Another great idea would be to read the comments on these articles and see if the readers have further questions you can address in your article. Every editor or blogger has one important objective: to grow their traffic numbers. In the online world, if you don’t have traffic you don’t have anything, right? To get the traffic they need to publish regular content that provides the best possible value to their readers. Whether it is a funny piece, an inspiring story or a very informative how-to article, if the readers love it, they will share it. It is all about the needs and preferences of the audience for each website. And surprisingly, these are not hard at all to figure out. You will just have to look at what that specific audience comments on and shares the most. This is easily done through tools like Buzzsumo or EpicBeat (they both have a free version you can use). All you do is write the name of the website in the search bar and press send. You will immediately have a list of their top content (based on the number of comments and shares). Look at the general topic/subtopic. Look at the format of the article: is it a how-to post, is it a list? Look at the comments; you might get some content ideas straight from the readers. Then think about your topic and how you can write about it, in a similar way. You can even try to pitch a follow up of the same article (if it is in line with your topic, of course). If you choose a topic that is a great fit for the audience of the website you want to write for, your chances of getting featured will skyrocket. Because, unless you already are a notoriety in your field, the editors will first pay attention to the topic you are pitching. The way I look at it, it’s pure psychology and a sales interaction: you are selling yourself and your ideas to an editor or blogger. And just as psychology is a science, but the results depend on the skills of the psychologist, your guest blogging success will greatly depend on your abilities to put together an email pitch that it is hard to say no to. To start tracking down a publication’s guest blogging guidelines, start your search on the company’s primary blog webpage and search for page entitle Write for us/Guest post guidelines/Submit an article. Just like I did below, where I looked for the guest blogging guidelines of ScaryMommy.com, a popular parenting blog. Once you found the guidelines, read them (and I mean read them!). This is where you will find all the information you need to prepare your pitch. You will also know what to expect after your pitch is approved and your article is published. The editors didn’t bother to put this info there if they don’t want you to follow it to the tee. But also, don’t think that if you follow the guidelines, your pitch will be accepted. It is just a basic thing you must do, so that you are off to a good start. It is a piece of the puzzle. Research on publishing best practices shows that 85% of editors open emails based on the subject lines. Pay attention to how you formulate your email subject. Spend some time to think about what would make that specific editor stop scrolling through his cluttered inbox and pay attention to your email. If you can, try to insert the main idea of your post into the subject line. Take some time to learn about the person who will read your email. You should write a personal email, so addressing them by their name is a good start. Also, you can mention a recent guest post or podcast interview you read/listened to, or say something about their services/products, or mention something they shared in their latest email newsletters. Mentioning the most recent post on the blog will no longer cut it, everybody does this so do things differently if you want to stand out. They will care more about the actual content you are pitching, and not your personal profile. Give them the basics, so that they understand why can you write about what you want to write. Also, this shows you respect them and their time. Time is a very rare resource these days. Here I would suggest coming up with three article ideas that are a great fit for that website (the main idea + two alternatives). Also, I like to include one phrase for each idea, to explain what the article will cover and the angle. You can show upfront that your ideas are valuable and in line with the theme of the website. It will make it easier for the editor to request any changes now (like adding other ideas he would like you to cover or changing the angle), before the article is written, instead of spending a lot of time on editing after that. This will also increase your chances of producing an article they will like and publish. Of course, if the guest blogging guidelines say that they want you to submit your article upfront, you must do it. Show them that you can produce quality articles. This means that you should include a few samples of previously published articles. Not every website requires this. Usually this is a requirement of the more advanced ones. These samples can be blog posts you published on your own blog, on Medium (if you don’t have a blog) or on other websites (other guest posts). Of course, these sample articles should be on topics that are related to the topic you want to cover for them. Don’t send a link to a rant on how Trump won the presidency if the theme of the website is SEO. Tell them what they want to hear (and deliver, of course): that you read the guest blogging guidelines (or carefully studied their content) and you will write and format your article accordingly. If you can include a royalty-free image, let them now. This is a real example of one of my first pitches I sent to a website with 2 million monthly readers when I was just a beginner. I hear back from the busy editor 2 hours later, and I had my first guest post published soon after that. It is simple, to the point, but most of all, it is genuine, and it creates a real human connection. I am a constant reader of tinybuddha.com and, at a certain difficult time in my life, I found a lot of help in one small article which was published on that specific day! It was so powerful! It was the sign I needed to make a difficult decision I was postponing and finally start living my life. So, thank you very much for creating this! You are touching people’s lives in such a meaningful way! I have written a blog post where I talk about my own story on living with the regret of never trying. If you like it and choose to publish it, maybe it will be the sign long awaited by somebody else. The article itself – it was a great match for them, and it was written in a way that followed their guidelines to the tee. The personal and genuine way I wrote my simple pitch. These are the two things you should always keep in mind. I don’t believe in email templates. No matter how well they are written, they won’t work for everyone. Every person who reads your emails is different. It is always better to know what the main components of an excellent email pitch are, and then personalize each one you send out. Make it about you and the person who reads it. An email that appeals at a personal level goes a long way. Some websites have a certain email address where they want to receive all the guest blogging submissions. Also, they might even have a mandatory way of formulating your email subject line and required information to include with your email (links to your social media profiles, your photo, answers to other questions from their part, etc). You can find all these details in the guest blogging guidelines. Pay attention to the grammar. If your email is full of spelling and grammar mistakes, it will not matter if you say your article will be a quality one, as they won’t believe you. Also, this shows to the editor that they will have to work a lot on your article to edit it before publishing it, so it will only make their life harder. Luckily, today it is quite easy to do this. You can ask a friend to help you, or you can use tools like Grammarly and Hemingway (both come with a free version that is enough for this purpose). And sometimes, even if you do your best with researching and carefully crafting your pitch email, they might not answer back or they might say they are not interested. Does this mean that you should never send them another pitch again? Certainly not! Remember this: they said no to your specific article ideas, not to you, as a person. Don’t take it personally and don’t think your ideas are worthless. Just go back to the blackboard and try again. And now a final thought. Remember, even if your pitch is accepted, you’ll need to follow up with a great article. Otherwise, you will not get featured. Pitching an article to a popular blog can be overwhelming. But once you’ve done it a few times, it gets easier, I promise. I am curious, what website will you pitch now that you know how to put together a killer pitch? Let me know in the comments below. Olivia Angelescu is an online media strategist who helps entrepreneurs become the go-to expert in their market and get booked solid.